It is with great sadness that we announce the passing on December 18, 2012 of John Charles Hutton, PhD, Professor of Pediatrics and Cellular & Developmental Biology, and Research Director of the Barbara Davis Center for Childhood Diabetes. An Australian by birth, John attended the University of New South Wales in Sydney, gaining his BSc in Biochemistry and Physiology in 1969. He then joined the laboratory of Dr Fred Hollows, a pioneering New Zealand and Australian Ophthalmologist at UNSW, where he studied the links between the metabolic changes resulting from diabetes and long-term disease complications, receiving his PhD in 1974. After conducting post-doctoral studies in Bolivia and Brussels he established his own laboratory in the Department of Clinical Biochemistry at the University of Cambridge in England, where he began his investigation into the physical and molecular properties of the insulin secretory granule and its role in diabetes pathogenesis. These studies would remain the principal focus of his research for the remainder of his career. His outstanding contribution to the advancement of knowledge concerning diabetes was recognized by the award of the Minkowski Prize by the European Association for the Study of Diabetes in 1988. In 1995 he accepted the post of Research Director at the Barbara Davis Center, and was instrumental in expanding its reputation as a Center of Excellence in Basic and Translational Diabetes research. In addition to maintaining his interest in beta cellular biology and development he also made seminal contributions to our understanding of islet autoimmunity. These include the identification of two proteins (IA2-ß aka phogrin, and IGRP) that were subsequently shown to be molecular targets of human autoreactive T cells. Most recently, he demonstrated that the granule protein ZnT8 is a major target of both human T cells and autoantibodies. The latter was arguably the most significant advance in the development of biomarkers for type 1 diabetes for over a decade. In addition, as Research Director at the BDC, John was also the Director of the JDRF-BDC Autoimmunity Prevention Center and of the UCHSC Diabetes and Endocrinology Research Center (“DERC”). John was a highly productive scientist, authoring over 200 research articles, commentaries and reviews, and presenting his work at many national and international conferences and invited seminars. He was also an outstanding mentor, furthering the careers of numerous students, fellows, and faculty that were associated directly or indirectly with his laboratory. 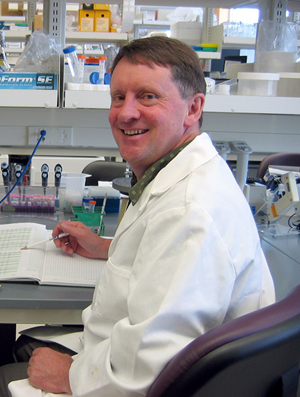 His long time colleague and collaborator Howard W. Davidson continues the work on the research projects John initiated. Here is a link to the initial presentations from the John C. Hutton Science Symposium held April 12, 2013 on the University of Colorado Anschutz Medical Campus.